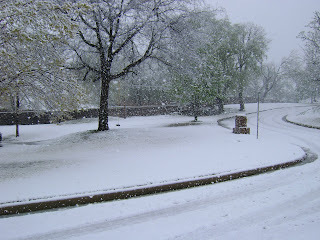 The Alexanders: Snow in March? OK I'm sure everyone else in Tulsa will have these kind of pictures on their blog, so we will join them! This past Saturday we had one of the most beautiful snows I can remember since I have lived in Tulsa (8 years!) I think we got around 8 inches of snow...it was coming down all day from about 9am-5pm! I am so glad it was on a Saturday so we could all enjoy it as a family...I just love it when Craig is home with us. It was piling up all around us and Craig and Avery went to play in it a little in the afternoon. 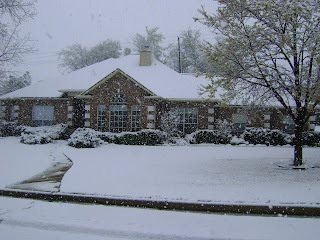 Here are some pictures of our house in the beautiful white wonderland. Snow on March 28th!! Who would have ever guessed? ?